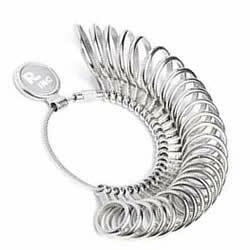 Traditionally, in the jewellery business, ring sizes were based on arbitary scales and these are still in use in the US, UK, Ireland, Asia and Australia. In the US this scale is numerical rising in quarters from size 0. In the UK an alphabetical system is used starting at A and going up to Z, there are also a number of oversizes denoted by Z+1, Z+2 etc. Asian Countries use numerical scales and most of continental Europe uses sizes based on measurement of the inside circumference of the ring as defined by ISO 8653 (see below). The US ring size system, used in the United States and Canada, has each quarter size increase being an increase of 8/1000ths (0.008) of an inch in the inner diameter of the ring. 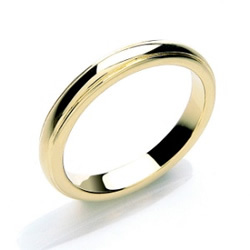 The UK ring size system is used in Ireland, Australia and New Zealand as well as in the UK. The British size A corresponds to US size ¼. The Asian ring size scale is based on a numerical scale starting at 1 and is used in China, Japan, Hong Kong, Singapore, Macau, Taiwan and other South East Asian countries. An Asian size 1 ring corresponds to a US size 1¾ and at the larger end of the spectrum an Asian size 27 is equivalent to a US size 13. The following ring size converter is based around US ring sizes, with the European size being to one decimal place. UK and Asian sizes are shown next to the nearest US size. Detailed measurements for UK ring sizes and exact measurements for Asian ring sizes are specified on their respective pages.